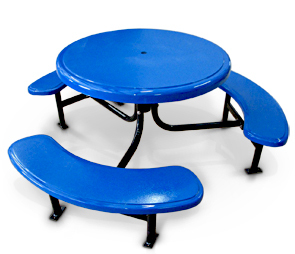 Durability, comfort and available in a wide variety of striking colors these 6' round fiberglass picnic tables with 42" table tops are ready enhance their surroundings and for a long time to come. 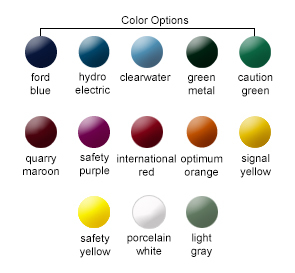 The previously mentioned 'striking color' is achieved with a commercial grade two-part (catalyzed) polyurethane paint process, guaranteed not to crack, fade or peel. Powder-Coated frame is bolted together with high-grade stainless steel hardware. 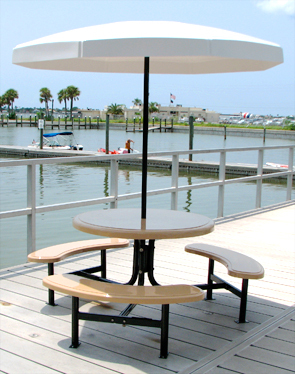 Built-In umbrella holder also serves to prevent wobbling and smart design provides more foot space.